The Schools Team have just completed their Easter assembly tour. 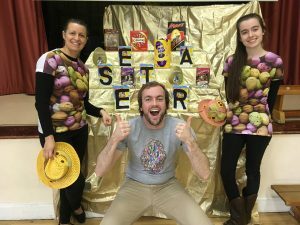 They have really enjoyed travelling around different schools across the city and some of the surrounding areas, for, as one Head Teacher described it, sharing ‘what’s behind the Easter Egg’. On the back of six of the eggs they had displayed the word EASTER which serves as a mnemonic. The team then helped the children to learn how the real Easter story can be remembered using the word. Easter is all about Jesus, his Early years. Jesus as a peaceful mans and his many miracles is Always Surprising. He was Tried not once but three times. He Endured such terrible things during Holy Week and now He is Risen! Showing a video of the Easter story told by other children, it was wonderful to hear the children make different suggestions for the R, such as reborn, rescued and resurrection. Before closing with a reflection and prayer, the team recapped the great way to remember the Easter story, with the word Easter! And of course that Christians celebrate that Jesus is Risen by giving and receiving of eggs! Another staff member said ‘Thank you for the wonderful assembly, what you shared was really helpful for children to understand a difficult story.’. We hope all children and staff have a wonderful Happy Easter!